Music Building I, constructed in 1963, houses classrooms and seminar rooms, Esber Recital Hall, the choral rehearsal room, a graduate resource center, the choral music library, faculty and graduate student offices, all music administrative offices, and organ practice rooms. Connecting to Music Building I by a second-floor breezeway and student lounge, Music Building II was constructed in 1993. 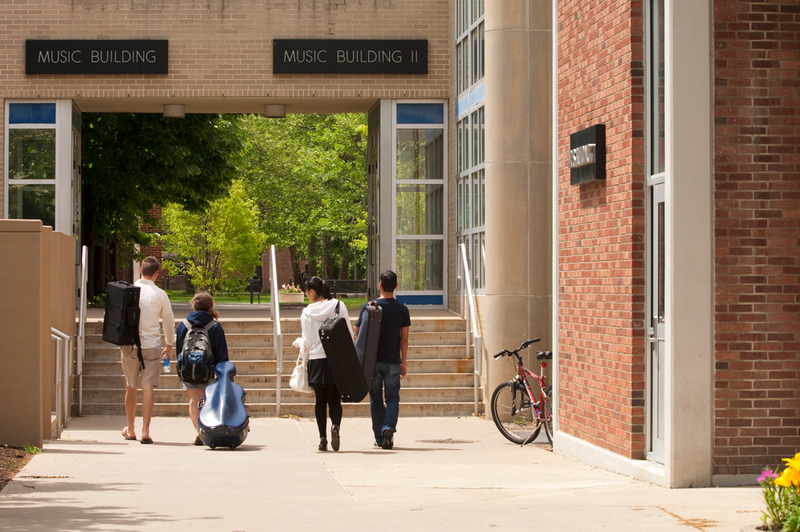 It houses faculty studios and graduate student offices, percussion studios and storage, classrooms, the instrumental ensemble library, music technology facilities, numerous practice rooms, and a piano lab consisting of 17 Yamaha Clavanovas. These weighted key, MIDI-capable instruments are used to teach secondary piano to all music majors. Music Building II also houses a suite of four recording studios that serve the dual purposes of providing training in audio production and of producing professional quality audio projects.